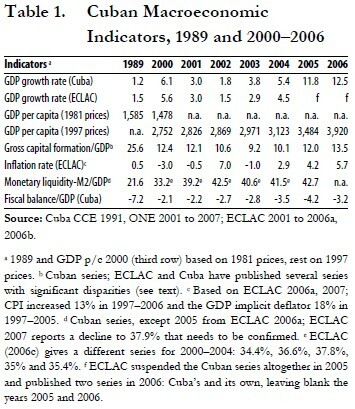 The unreliability of recent Cuban economic-financial statistics is illustrated by their scant inclusion in ECLAC’s annual economic report on the region: out of 25 tables for 2006, Cuba was included in only seven: GDP in absolute terms and growth rates, gross capital formation, external debt and as a percentage of exports, urban unemployment, and consumer prices. With regard to GDP and capital formation, ECLAC published the Cuban official series along with its own estimates, but left blank the figures for 2005–2006; data on the external debt and as a percentage of exports were not published in 2005–2006 either (ECLAC 2006b). (1) The shift in the base year to estimate GDP at constant prices, from 1981 in 1985–2000 to 1997 since 2001, induced an average 56% increase in GDP each year in 1989–2000, the period for which the old and new series are available, and a GDP per capita jump of 86% in 2000 (Table 1), both remarkable increases remain unexplained by Cuban authorities. Based on the old series, GDP per capita in 2000 was 7% below the 1989 level (after eleven years of the “Special Period”), but based on the new series, it was 147% higher in 2006 than the 1989 level, a feat accomplished in just six years, without parallel in the world. Capital Formation and Domestic Investment. A rigorous assessment of trends in gross and fixed capital formation and domestic investment as percentage of GDP in 1989–2006 is difficult due to multiple series with significant contradictions published by Cuba and ECLAC, compounded by the change in the base year for GDP in constant prices from 1981 to 1997. Based on Table 1, gross capital formation (GCF) at constant prices of 1997 (except for 1989) fell from 25% of GDP to 9.2% in 2003 and grew to 13.5% in 2006, still half of the 1989 percentage. Other series show similar decreases relative to GDP: Cuba’s GCF at current prices from 13.5% to 10.3% in 1996–2006; Cuba’s fixed capital formation from 25.6% to 9.8% in 1989–2006; Cuba’s investment at current prices from 15.2% to 6.8% in 1989–2004; and ECLAC’s gross domestic investment from 25% to 9.3% in 1989–2004 (Mesa-Lago 2005, updated with ONE 2006, 2007; Espinosa 2007d). Cuban economists have warned that investment has been insufficient to play the key role required for sustained growth and that a strong economic recovery would require a gross fixed capital formation rate of 25% of GDP (as in 1989); Cuba’s GCF rate in 2005 was 9.7% versus a regional average of 20% (ECLAC 2006b). Fiscal Deficit. The fiscal deficit as a percentage of GDP declined from 7.2% in 1989 to 2.1% in 2000 but rose to 4.2% in 2005 and decreased to 3.2% in 2006, ten times the regional average of 0.3%. The reduction in the deficit reportedly was the outcome of higher revenue (particularly an increase of 57% in sales taxes) relative to expenditures. Social security pensions and assistance jolted 22%, defense and internal security 16% (the third highest in the region relative to GDP), and education and public health 12% and 14% respectively (ONE 2007; UNDP 2006). Inflation and Monetary Liquidity. Based on the consumer price index (CPI), there were three years of deflation in 2000–2003, but thereafter inflation steadily rose and reached 5.7% in 2006, eleven times the 1989 rate and 19% higher than the regional average of 4.8% (Table 1; ECLAC 2006b). CPI figures are questionable because Cuba has never published data on the basket of goods and services used for its calculation and the Cuban series has shown deflation in several years while both the GDP deflator and monetary liquidity were rising. The increase of inflation in 2006 was due to expanding budget expenditures (discussed in the previous section), as well as price increases in free agricultural markets, utilities (inter-provincial bus and railroad transportation, domestic flights6) and hard-currency shops (TRD) (ECLAC 2006b; Mesa-Lago 2006).7 Monetary liquidity (M2) has been climbing since 2001 and reached a record 16 billion pesos in 2005, equivalent to 42.7% of GDP, the highest since 1994 and twice the level of 1989 (Table 1). ECLAC (2007) informs that M2 in absolute terms declined 3% in 2006 and more as percentage of GDP due to the reported huge jump in the latter, but also notes that M2 is understated because it is limited only to pesos excluding convertible pesos. As has happened before, the inflation rate rose in 2006 whereas M2 may have decreased. The performance in terms of physical output of 20 key products in the Cuban economy (principal exports, energy, food and manufactures) is presented in Table 2. In 2005, output of 15 products decreased, four increased and one was stagnant, a pattern that was reversed in 2006. Except for oil, gas, nickel, cigars and tubers, production in 2006 was considerably lower than in 1989. Industrial Sector. Total industrial output in 2005 was 46% below the 1989 level and in non-sugar manufacturing it was 45% below; out of 23 manufacturing lines, output in all except in three was considerably lower in 2005 than in 1989; in 15 lines, the decline ranged from 69% to 99%. As result, the industry’s share of GDP (including mining, manufacturing and utilities) shrank from 26.1% in 1989 to 13.8% in 2006 (Mesa-Lago 2000; ONE 2006, 2007). The mining and manufacturing sectors grew 1.9% each in 2006, the latter despite a decline in sugar production. Nickel. Nickel output peaked at 76,529 tons in 2001 (as a result of an investment of $350 million from Canada’s Sherritt International) but declined to 70,948 in 2003; production rose to 75,913 in 2004 (1% below the target) and decreased to 75,614 tons in 2005 (2% below the target) and to 73,000 in 20069 (4% below the target). Output in 2006 was 55% above the 1989 level but 5% below the 2001 peak (Table 2). At the end of 2005, Cuba predicted that nickel output would jump to 120,000 tons, based on anticipated investments (see below); the target for 2007 was initially set at 100,000 tons and later reduced to 76,000, back to the 2001 level, and a target of 80,000 has been set for 2008 (Frank 2006b). The three existing nickel plants are working at full capacity and new investment is required to expand output; furthermore, the newest plant, “Che Guevara” (Soviet- technology, located in Punta Gorda), consumes 18 tons of oil per each ton of nickel produced, compared to a ratio of 12 to one in the most efficient plant (U.S.-built “Pedro Sotto” in Moa). New investments promised are: (a) more than $300 million by Cuba; (b) $450 million in the “Pedro Sotto” plant by Sherritt International to expand capacity by 4,000 tons starting in 2008 (the initial announcement was of a $1 billion investment and a 50,000–ton output expansion, later reduced to 16,000 tons); (c) $500 million by China to complete the Las Camariocas plant left unfinished by the USSR to produce ferronickel, an agreement cancelled in 2007 and replaced by a $1 billion investment by Venezuela;10 and (c) $1.3 billion by China to exploit a nickel deposit in San Felipe that would produce 50,000 tons yearly, apparently still under study in 2007 (Mesa-Lago 2005; EFE, February 4, 2007; Israel 2007). Sugar. Sugar harvests in 2000–2007 averaged 2.5 million tons yearly, less than one-third the average of the volume of the crops of the 1980s. The restructuring of the sugar industry in 2002 shut down 45% of the sugar mills, shifted 60% of sugarcane land to other crops and dismissed more than 100,000 sugar workers, changes intended to cut costs, increase productivity and generate a profit, but successive output targets for 2004–2007 were not met and production drastically fell. Sugar agricultural yields are no longer published. The latest available data showed a drastic fall in the yield per hectare from 60.0 to 33.3 tons in 1989–2002; the industrial yield diminished from 12% to 10.3% in 1985–2006 (ONE 2003, 2004, 2006, 2007). Sugar output declined from 4 million tons in 2000 to 2.5 million in 2004; new data released by Cuba in 2007—after a three year hiatus—show further decrease to 1.3 million tons in 2005 and slight increase to 1.4 million tons in 2006 (versus a target of 1.5 million tons in both years). Reasons given for the 2006 low sugar crop were: the harvest began in January with only 42 mills (15 fewer than in 2005 and 27% of the number in 2002), five did not start until February because of delays in repairs; sugarcane land was further reduced by 54,500 hectares, the cane was of low quality with a lot of weeds; frequent equipment breakdowns interrupted grinding, reducing efficiency and yields and increasing costs (40% of the time was lost); in six of the 15 provinces, sugar mills did not meet the expected 70% grinding target and some were below 60%; fuel scarcity contributed to delays in transporting and grinding cane; lack of labor incentives affected workers’ efforts (Granma, January 13, February 9 and May 26, 2006; Espinosa 2007a; ONE 2007). After the harvest was over, Fidel and sugar minister Ulises Rosales reversed the 2002 industry restructuring, declaring that high world sugar prices required a new strategy to increase production, exports and revenue, through more investment, an expansion of 120,000 hectares under sugar cane, operation of 51 sugar mills, import of spare parts for the mills, increased use of fertilizers, etc. In mid-2006, the sugar ministry created a state company (Zerus) to enter into joint ventures related to the sugar industry with foreign investors (Granma, June 3; AP, July 26; AFP, August 27, and Reuters, November 14, 2006). The 2007 harvest is estimated at 1 to 1.1 million tons (25% below 2005 and the lowest in at least a century) versus a target of more than 1.6 million tons. Excessive rains, particularly in the eastern provinces, were blamed for the fiasco, but internal flaws were also identified: 30,000 hectares were sown (25% of the plan); only 47 mills started the harvest; breakdowns of the old machinery were frequent and transportation and supplies uneven; machetes and gloves had poor quality; and only two of the 13 provinces and 17 of the 51 sugar mills met the targets (Granma, February 27, April 29, May 21, 2007; Encuentro en la Red, Madrid, March 20 and 27, 2007; Reuters, Havana, April 27, 2007). In view of the problems in 2006–2007, the target of 3 million tons in 2008 is obviously unattainable. Domestic demand is 700,000 tons, leaving about 500,000 tons for export in 2006 and 400,000 tons in 2007, hence Cuba has been importing sugar from Colombia and Brazil, and announced that will buy 250,000 tons abroad in 2007 (Reuters, Havana, July 19, 2007). Key Manufactures. Five manufactured products shown in Table 2 played a key role in Cuba’s industrialization process before the crisis, serving mainly domestic consumption and to a lesser extent exports. During the Special Period, there has been a process of industrial decapitalization, lagging technology, shrinking output, and high dependency of manufacturing on imported raw materials and fuel (Pérez Villanueva 2004). Relative to 1989, output of four of these five products was below 2006: -18% for steel,11 -55% for cement, -88% for textiles, and -95% for fertilizers. Production of manufactures for domestic consumption, such as shoes and laundry soap, were 75% and 62% below the 1989 level, respectively. Only output of cigars, a traditional export product, increased over 35% of the 1989 level. A significant scarcity of cigars and cigarettes for domestic consumption in Havana (63–75% lower than normal) was reported in 2007, attributed to lack of trucks for transportation and hoarding by resellers (Tribuna de La Habana, March 18, 2007). Electricity. Electricity output fluctuated but was basically at the same level in 1989 as in 2006 and yet the population grew 7% in that period. The severe problems and decline in electricity output in 2005 have been analyzed elsewhere (Mesa-Lago 2005). In his speech to the National Assembly at the end of 2005, Fidel proclaimed 2006 the “Year of the Energy Revolution” and predicted that Cuba would become an energy model for the world: there would be one million additional kilowatt-hours of generation capacity, four times the capacity needed, the six thermoelectric plants (most of them 65 years old and wasteful) would be gradually replaced by 265 diesel-powered plants, combined with 4,518 emergency autonomous power plants (“grupos electrógenos”12) and new natural gas plants; wasteful domestic appliances, incandescent electric bulbs and kerosene stoves would be replaced by more efficient equipment, bulbs and electric stoves; 2 million sockets, 1.5 home connections, 12,400 transformers, and 16,000 electric poles would be substituted; 1.2 million breakers installed; there would be plenty of electricity, no more blackouts after May 1, 2006; and one billion pesos would be saved. Fidel initially estimated the cost of this program as $1.7 billion but later reduced it substantially (Granma, December 24 and 30, 2005). Early in 2006 he complained that “the strategists of the Ministry of Basic Industry and the Electric Union, clinging to erroneous dogmas and criteria, asserted that synchronization was unfeasible, and insisted that the way to solve the energy problem was to buy new thermoelectric plants. What colossal craziness!” He argued that the cost of one single thermoelectric plant would be $490 million and with less than that one could buy all the grupos electrógenos (Castro 2006). Some serious flaws of this program have been noted: it is a short-term palliative but not a long-term solution because the aging thermoelectric plants (eroded by the use of Cuba’s heavy, high-sulfur domestic crude) will increasingly deteriorate and break down, putting a heavier burden on the grupos electrógenos until they are insufficient and the whole system collapses; the diesel fuel needed by the grupos electrógenos dispersed throughout the island will have to be transported by a fleet of tankers; diesel fuel is more expensive than fuel oil and its consumption will rise with the increasing operation of the grupos electrógenos; the new electric stoves and domestic appliances distributed to the population will increase consumption and, if the electricity system fails, housewives will not be able to cook; the government could not collect the cost of one-fourth of the new domestic appliances sold to the population at a value of $430 million; electric conductors and structures on which high tension towers are sited are frequently stolen (2,094 in 2005 alone), and similar thefts can be perpetrated on the grupos electrógenos (Alfonso 2006 who cites Jorge Piñón; Encuentro en la Red, September 25, 2006; EFE, Havana, February 19, 2007; Trabajadores, May 15, 2007). Fidel had promised that the new strategy would eliminate all blackouts after May 1, 2006 and Yadira García, minister of basic industry, proclaimed that his promise had been realized (Reuters, June 13, 2006). Although significantly reduced, blackouts have not disappeared, voltage in peak hours has decreased significantly and transformers have blown out. Blackouts were reported in several municipalities of Havana in June 2006; in Matanzas, Havana and Pinar del Río in August 2006; and in parts of Havana in February 2007 (AFP, Havana, June 29, 2006; EFE, Havana, August 24, 2006; Cubanet, Havana, November 27, 2006; La Nueva Cuba, Havana, February 7, 2007). Evaluating 18 months of the “energy revolution,” Vice-President Carlos Lage reported that high quantities of diesel fuel are consumed at very high cost, fuel supplies are still vulnerable, electricity consumption may be reduced, and savings are insufficient (Juventud Rebelde, June 4, 2007). Agricultural Sector. Output of the agriculture-fishing sector decreased 11.6% in 2005 (versus a growth target of 2.5%) and fell 6% in 2006. Output in 2005–2006 in five key non-sugar products were well below 1989 levels: -12% for eggs, -18% for rice (700,326 tons were imported in 2005), -31% for tobacco (contrasted with an increase in cigar production), -63% for citrus (once an important Cuban export), and -63% for cow milk. The number of cattle heads peaked at 7 million in 1967 and steadily declined to 4.9 million in 1989 and 3.7 million in 2006, 24% below the 1989 level (47% below the peak year); the decrease in heads per capita was from 0.83 to 0.33 in 1989–2006 (Mesa-Lago 2000; Table 2); the reduction of the cattle herd led to a drastic fall in beef and milk production. Statistics on coffee output have been discontinued, but the 2005 harvest was 25% lower than 2004, one of the worst in the last 50 years (Reuters, Havana, March 11, 2006). Output of tubers steadily increased and peaked in 2004 but declined in 2005 and 2006; in the last year output was 123% above 1989. Output of beans in 2006 was almost six times the 1989 level despite a 25% decrease in 2006, whereas production of vegetables was four times higher despite a fall of 35% in 2005–2006 (CCE 1991; ONE 2007). It should be noted, however, that output of tubers, vegetables and beans is probably overestimated in recent years as it includes, since 2000, an “estimate of production in backyards, urban gardens and self-consumption in cooperatives and private farms” (ECLAC 2006a). Traditionally, external factors such as the embargo and the weather have been blamed for poor agricultural performance: (1) the lack of fodder for poultry and cattle that affected meat and diary products, imports of these products dropped 52% in 1989–2000 but they have increased since 2002 with the surge of U.S. imports; (2) three hurricanes in 2005 (Dennis, Katrina and Wilma) that caused severe losses, particularly in citrus, tobacco, coffee and poultry, but there were no hurricanes and good rainfall in 2006 and still agricultural output decreased (ECLAC 2006b); (3) the severe draught in 2004–2005 that resulted in about one billion pesos in losses; and (4) heavy rains in 2007 that harmed the sugar harvest. A series of articles published mostly inside of Cuba in 2006–2007, have identified and analyzed systemic causes of the decrease in agricultural output. First, despite the 1993 agrarian reform, land structure and ownership continues to be inefficient and lack incentives: 58% of the agricultural land is still held in the form of state enterprises; another 23% is state farms now transformed into producer cooperatives (UBPC) but these cooperatives inherited state debts and obsolete equipment, their members were neither consulted when the transformation took place nor trained and they continue to behave as state employees, the government directs production with little input from members and buys virtually all their output below market prices, their sales to free agricultural markets are subject to a price cap, only 44% of them are profitable whereas the rest require state subsidies; 13 another 8% of the land is worked by credit and service cooperatives (CCS), also under strong state control that lack tractors or their equipment is broken; 6% of the land is in another type of producer coop (CPA) whose size has dwindled under the burden of heavy debts and lack of profits; and private farmers that have 11% of the land but produce two-thirds of the food. Second, the state procurement system (acopio) is a monopoly that operates as an intermediary that “buys cheap and sells dear”14 and is afflicted by serious flaws: (a) generates a high average profit of 29% (as high as 41% in bananas bought as second quality from producers but sold as first quality to retailers); (b) delays payments to sellers as much as two months thus accumulating huge debts; (c) sets prices monthly in a rigid manner, has poor information on inventories and demand, and does not reduce prices even when the produce is of poor quality and is not sold, hence it rots (an expert must be called to evaluate if prices should be cut but often there is no phone to call him and when he arrives the produce is already over-ripened and decomposed); (d) has inadequate storage and weighing equipment, as well as insufficient and obsolete transportation equipment part of which is broken or lacks gasoline, batteries, tires, etc. ; and (e) provides sparse inputs to producers (fertilizers, seeds, fuel, machetes, boots, gloves) that are grossly insufficient for them to meet output targets. Third, substantial losses are caused by organizational flaws, for example, millions of litters of milk spoiled in 2007 due to delays in collection, lack of bottles, deficient control, and lack of experienced cattle workers. Fourth, 39% of the land previously devoted to sugarcane that was supposed to be shifted to food production is idle and covered by weeds—marabú (land distribution from ONE 2006; rest from Borrego 2006; Castellanos 2006; “El Gobierno…” 2006; Espinosa 2006; León and Martín 2006; Pagés and Castaño 2006; Pérez 2006; Frank 2007b; AFP, Havana, April 1, 2007; EFE, Havana, May 10, 2007). Fish and sea food. The catch peaked at 244,000 tons in 1986, declined to 192,000 in 1989 and to 54,796 in 2006, 71% below the 1989 level and 78% below the 1986 peak. The aging fleet is plagued by high debt, lack of solvency both in pesos and dollars, poor credit, corruption, high fuel prices, damage inflicted by hurricanes, and the electricity crisis. At the end of 2006, the European Commission found deficiencies and insufficient vigilance over the control of contaminants in Cuban fishing products and asked the government to improve sanitary control (Mesa-Lago and Pérez-López 2005; EFE, Brussels, November 24, 2006). 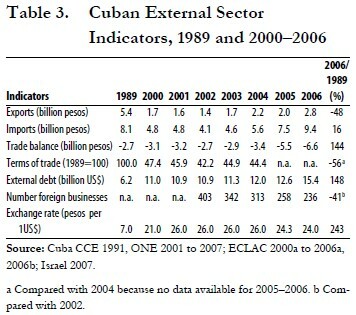 Cuban external sector indicators are shown in Table 3. The availability of these statistics, which used to be the most comprehensive and reliable, has decreased significantly in recent years: latest complete figures on trade of goods in the most recent Anuario are for 2004; data on nickel exports were discontinued after 2002; the full balance of payments series was halted in 2001 and only partial data are available for 2005–2006 (ONE 2006, 2007); ECLAC series on balance of payments are incomplete and contradictory (see below) whereas ECLAC (2006a) series on terms of trade has not been published since 2004. Trade Balance of Goods. The value of exports of goods shrunk sharply during the crisis and was stagnant in 2000–2003; it rose thereafter but in 2006 was 2.8 billion pesos, still 48% below the 1989 level. On the other hand the value of imports of goods increased much faster in that period and in 2006 reached a record 9.4 billion pesos, 25% over 2005 and 16% over 1989. Total trade turnover in 2006 was the highest during the Special Period: 12.2 billion pesos, but still 10% below the 1989 level. The merchandise trade deficit reached historical records: 6.6 billion in 2006, 20% over 2005, and 144% above the 1989 level. These data confirm the traditional weakness of Cuba’s external sector, which after 18 years of economic transformations has not come close to achieving a merchandise trade balance and less to generate a surplus. Unlike earlier periods, Cuba no longer benefits from automatic Soviet long-term loans to cover trade deficits, at very low interest rates and with concessions; after the collapse of the USSR Cuba had to resort to short-term loans from foreign banks and other financial institutions, which charged high interest and demanded repayment (but see section on external debt). Terms of Trade. During 1989–2004, the terms of trade deteriorated by 55.6%. In 2004, rising prices of imported oil and food were not offset by a rise of nickel prices, while prices of sugar continued to be relatively low, resulting in 0.5% deterioration in the terms of trade. In 2004–2007, Cuba signed numerous economic and trade agreements with Venezuela that include substantial subsidies; for instance, Venezuela sends 100,000 barrels of oil daily at a preferential price of $27 per barrel, while world prices averaged about $65 a barrel in 2006, resulting in a subsidy of about $1.4 billion in 2006; and Venezuela now pays the salaries of about 22,000 physicians and other health Cuban professionals stationed in that country that previously were paid by the Cuban government (see section on trade partners). Trade Composition. The share of sugar in total exports steadily declined from 73% to 8% in 1989–2006 despite an increase in price in the last two years. The value of nickel exports are not available but nickel is the major component of aggregate mining export value, that rose from 35% to 48% in 2003–2006, mainly as a result of an increase in prices as output was stagnant/falling in that period. Shares of other traditional exports declined in 2003–2006: tobacco’s from 12.8% to 8.6%, fish and sea food’s from 8.1% to 2.3% and citrus’ from 0.6% to 0.2%. The share of a non-traditional export, pharmaceuticals, increased from 3.6% to 5.9% in 2003–2005 whereas the share of cement decreased from 2% to 1.4% and of iron from 2% to 1.6% (ONE 2007). Despite alleged substantial growth of biotechnological and genetically engineered exports (BBC News, January 16, 2006), Cuba’s statistical yearbook does not show any such exports. According to a Cuban economist, Cuba bet on the biotechnology industry as an export leader at the start of the 1990s, but the expectations have been reduced considerably in recent years (Monreal 2004). Albeit shifts in export composition, 68% of Cuban exports in 2006 were traditional primary products typical of underdeveloped countries (nickel, sugar, tobacco, fish, fruits), a minority being manufactured or semi-manufactured products. The composition of imports showed important changes in 1989–2006. The share of several imports rose: food from 13% to 14% (18% in 2005, in tandem with decreasing domestic self-sufficiency on food) and manufactures from 14% to 20%. Meanwhile, the share of fuels decreased from 32% to 24% (because of de-industrialization and Venezuela’s supply at subsidized prices), of chemicals from 10% to 7% and of machinery/transportation from 31% to 24% (but rose to 32% in 2006 due to the buying of diesel generators and transportation equipment16) (CCE 1991; ONE 2007). The poor agricultural performance has required massive food imports and aggravated budget and foreign trade deficits. Vice-Minister of economics Magalys Calvo recently declared that Cuba imports 84% of the food needed for the basic consumption basket, the most important category of imports after oil, at a cost of $1 billion17 (Granma, February 26, 2007). Trade Partners. After the collapse of the socialist camp, Cuba significantly diversified trade partners. In 2006, main partners and their shares of total merchandise trade were: Venezuela, 35.4%; China, 14.9%; Spain, 8.2%; Canada, 7.3%; Netherlands, 6.9%; Germany, 5.5%; United States, 4% (seventh due to food exports); Brazil and Italy, more than 3% each; Russia, 2.4% (compared to 65% with the USSR in 1989); and France, 2% (ONE 2007). Venezuela and China combined took half of Cuban total trade, whereas the share of all other countries decreased in 2005–2006. Not only has Venezuela become Cuba’s leading trade partner (reports in 2007 indicate a 30% increase in Venezuela’s trade share), but it is approaching the role of great subsidizer that the Soviet Union played in 1960–2000. Through numerous trade and economic agreements signed with Cuba in 2004–2007, Venezuela has committed more than $4 billion for the following projects: at least $300 million in agriculture, industry and infrastructure; $1 billion investment in the Las Camariocas nickel plant (an investment abandoned by the Chinese); undisclosed amounts in a joint venture with Cuba and China to produce stainless steel, and build a thermoelectric plant by Venezuela alone in Mariel; about $500 million to refurbish the Cienfuegos oil refinery; $1 billion for housing construction; $1.5 billion to complete 335 projects that include 12 joint ventures (for a total of 31) in exploration and extraction of oil, building a submarine communications cable between the two countries, construction and repair of vessels and ports, three hotels with 2,872 rooms, communications media and railroad equipment; and an undisclosed sum to subsidize 100,000 Venezuelans vacationing in Cuba annually18 (Mesa-Lago 2005; El Tiempo, Caracas, April 6, 2006; Snow 2006; El Universal, Caracas, July 10, 2006; La Nación Cubana, Havana, January 27, 2007; AFP, Havana, March 2, 2007; Israel 2007). China is Cuba’s second trade partner as the result of agreements signed in 2004–2006 that included deferral for 10 years of obligations accrued by Cuba, credits for $200 million to buy Chinese goods and establishment of mixed biotechnology enterprises. China’s announced investment of $500 million to finish the Las Camariocas nickel plant was cancelled, whereas negotiations to exploit the San Felipe nickel deposits have not materialized after three years. Starting in 2007 Cuba has agreed to export 400,000 tons of sugar annually to China, which seems unfeasible in view of other Cuban export commitments and domestic needs (Notimex, Havana, November 13 2006; Reuters, Havana, March 28 2007). Cuba does not hold full membership in the major regional commercial associations (CACM, NAFTA, MERCOSUR19) and has been excluded from the Free Trade Area of the Americas, but together with Venezuela, Bolivia and Ecuador has started a new regional trade association ALBA; Cuba has joined CARICOM, but trade with Caribbean member countries was only 0.8% of Cuba’s trade in 2006 (ONE 2007). The lack of democracy and violation of human rights in the island has barred its membership in the Cotonou Accord and access to the European Union’s $14 billion aid fund. In 2005, however, the EU suspended political sanctions imposed on Cuba in 2003, and in 2006–2007, Spain split the EU common stand with a new policy of dialogue as well as negotiations for paying the $1 billion debt owed to Spain and increased trade. External Debt. The hard-currency external debt jumped 148% in 1989–2006, from $6 to $15.4 billion (22% between 2006 and 2005), mainly due to accumulation of unpaid interest and the depreciation of the dollar in recent years, and new debt with Venezuela and China. Cuba has defaulted on payments to Japan, Belgium, Canada, Chile, Mexico,20 France, South Africa, Spain, and the United Kingdom. At the end of 2004, Cuba’s total external debt was estimated at $35.4 billion (38% in hard currency and 62% in non-convertible currency with former socialist countries), equivalent to $3,100 per capita, more than twice the average per capita debt in Latin America (Mesa-Lago 2005).21 As a percentage of exports of goods and services in 2004 (latest year available), a measure often used by financial institutions to assess ability to repay, Cuba’s hard-currency debt alone was 213%, 54% above the regional average of 138% (ECLAC 2006b). The president of Cuba’s central bank reported that the short-term debt decreased to 27% in 2005 v. 73% for medium- and long-term debt, because the new oil debt with Venezuela is long-term (such debt to Venezuela in 2001–2005 was estimated at $2.5 billion), refinancing of previous short-term debt, and new medium-term credits (Soberón 2005). In those calculations he excluded half of the total currency debt that might be short-term (ECLAC 2007), and ONE’s (2007) disaggregated data on the debt does not allow a comparison with previous years. Foreign Investment. No data has been published on cumulative foreign investment since 2002, when it was reported that it amounted to $2.5 billion disbursed. Statistics on foreign direct investment (FDI) have been discontinued since 2001, when FDI shrank by 91% (from $448 in 2000 to $39 million pesos in 2001), but a significant jump to $981 million was reported in 2006 largely due to Venezuelan investment (AP, Havana, June 26, 2007). The number of mixed enterprises with foreign investors decreased from 403 to 236 in 2002–2006, a drop of 41% in four years (Table 3); the number of production contracts declined by 74% in 2002–2005, from 441 to 115 (Cuba News, Havana, June 2006). In 2006, the Cuban government shut down two Spanish enterprises: Zell Chemie S.L. is demanding $3 million for misappropriation of its intellectual and technological property, transgression of the law in liquidation proceedings, and debt of $1.5 million; Acciona Infraestructura was promised $3 million in liquidation but the Cuban government had not paid it by mid 2006 (Cancio 2006). Benetton closed two of its five shops in Cuba because of import difficulties (EFE, Havana, March 28, 2006).22 Marta Lomas, Cuban Minister of Foreign Investment and International Cooperation declared in 2007: “We are not interested in doing too many [joint ventures]… only those that have an impact on the economy.” She argued that the decline in the number of joint ventures is because Cuba no longer needs small firms and is giving priority to strategic sectors such as energy, mining and tourism (cited by Israel 2007). Affecting foreign financial operations is the halting of business with Cuba of two major Swiss banks (UBS and Credit Suisse) due to the UBS scandal in 2005 and high cost of enforcing legal rules on deposits; the closing of U.S. dollars accounts by costumers with dual citizenship with Cuba by three Canadian banks (Royal Bank of Canada, Bank of Nova Scotia and Toronto Dominion Bank), and the closing of the Dutch bank ING and British Barclays (Sontag Zeitung, Geneva, November 12, 2006; Reuters, Havana, July 6, 2007). The Economic Intelligence Unit (2007) ranked Cuba in 81st place among 82 countries for its business environment, based on 90 indicators including: attractiveness for investors, market opportunities, policies toward private enterprises, macroeconomic stability, fiscal situation, politico-economic context, labor market, and infrastructure. Exchange Rate. At the end of 2004, the U.S. dollar ceased to be legal tender and only convertible pesos (CUC) are accepted by all state entities (including TRD) that sell in hard currency. Those who need to exchange dollars to CUC are charged a 10% fee, but this fee is not imposed on exchanges of Canadian dollars, Euros, British pounds, and Swiss francs. In March 2005 the value of the CUC peso was arbitrarily raised by 8%: one CUC is now exchanged for 24 pesos (instead of 26), but is bought for 25 pesos (instead of 27); an extra one peso is charged as commission for the exchange by the Central Bank. In April 2005, the value of the CUC peso vis-à-vis the dollar and other hard currencies was increased by another 8%, leaving unchanged the peso/CUC rate. Thus, the value of the dollar versus the CUC has been reduced by 20% ($0.80), combining the 10% fee, the new exchange rate, and the commission (Mesa-Lago 2005; Table 3). Tourism. The number of tourists rose from 270,000 in 1989 to 1.77 million in 2000, stagnated in 2001, declined in 2002 (due to 9/11), steadily rose to 2.3 million in 2005 and decreased to 2.2 million in 2006, still 8 times the 1989 level. The number of tourists in the first two months of 2007 was 7% to 13% lower than the number in the corresponding months of 2006; Spanish tourists dropped by 45%, Cuban- Americans by 30%, Germans by 20%, Canadians by 3%, and also did French, Italian, and British tourists (EFE, Havana, May 7, 2007). Gross tourism revenue includes the cost of imported inputs, which must be deducted to calculate the net tourism revenue, occasionally given between 61% and 70% of gross revenue; the latter jumped from $168 million to $1.9 billion in 1989–2000, but declined to $1.8 million in 2001–2002; it grew to a record $2.3 billion in 2005 but decreased to $2.1 billion in 2006, 12 times the 1989 level. The target of 2.5 million tourists for 2006 was not met by 11% whereas the target of $2.6 billion in revenue originally set for 2002 has not been met and was unfulfilled by 21% in 2006. 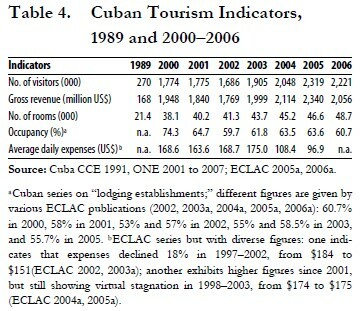 The number of tourist rooms more than doubled in 1989–2006 (from 21,400 to 48,700) but the occupancy rate decreased from 74.3% to 60.7% in 2000–2006 and ECLAC gives lower rates in most years (see notes in Table 4). Balance of Payments. Cuba has not published full balance of payments statistics since 2001 (ONE 2005a). 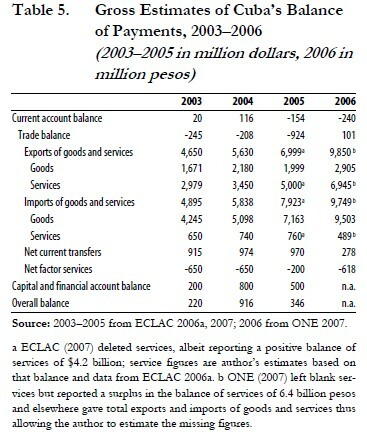 ECLAC (2007) figures on the balance of payments for 2005 did not provide estimates for import and export of services, which have been roughly calculated by the author based on previous estimates (ECLAC 2006a): the huge deficit in the balance of goods ($5.2 billion) was not offset by the surplus in the balance of services, mainly tourism and medical service exports performed abroad ($4.2 billion), despite its 56% increase over 2004; the total trade balance deficit increased to $924 million and the current account deficit to $154 million; the global balance decreased to $346 million, 62% less than in 2004. The author’s partial reconstruction of data for 2006 (based on ONE 2007) suggests that despite another big jump in the surplus of the service balance (6.4 billion pesos), it was still lower than the deficit in the balance of goods (6.6 billion pesos); the current account deficit grew to 240 million pesos, because of the huge goods deficit, the decline in net transfers, and the increase in net factor services (due to payments of debt interest and repatriation of profits); it was impossible to estimate the overall balance due to missing elements regarding capital and financial accounts. Payment for health services (mainly physicians) by Venezuela has become the major stabilizing factor in Cuba’s balance of payments; the question is how those services are measured. Based on the original trade agreement between the two countries, Cuba would send and pay salaries of physicians to finance in part oil imports from Venezuela; but the 2005 agreement changed that arrangement and since then Venezuela has been paying the physicians, reportedly as many as 20,000 physicians. Rough estimates suggest that the average yearly compensation of each physician at about $250,000, an obvious overestimation. One year had elapsed in August 2007 since Fidel’s transfer of power to his brother Raúl. This section summarizes the current state of the Cuban economy and the next section reviews Raúl’s minor policy changes. Confronting declining GDP growth rates and a lingering and incomplete recovery, and probably to show economic improvement, the government overvalued GDP through two statistical manipulations: GDP based on 1997 prices increased values by a yearly average of 56% in 1989–2000 over GDP in 1981 prices, and GDP’s conventional methodology was replaced by a Cuban invention that overvalues free social services and price subsidies. When adjusted to account for these two overvaluations, the GDP growth rate of 12.5% in 2006 was reduced to 4.4%, below the regional average of 5.3%. Fixed capital formation fell from 25.6% in 1989 to 10.3% in 2006, about half the regional average; a deflation rate of 1% in 2003 turned into growing inflation that reached 5.7% in 2006, higher than the regional average of 4.8%; the fiscal deficit rose from 2.8% of GDP to 3.2%, ten times the regional average; and monetary liquidity (M2) grew from 40.6% to 42.7% of GDP in 2003–2005, contrasted to 21.6% in 1989. Total industrial and non-sugar manufacturing output in 2005 were 45–46% below the 1989 level (output in 15 out of 23 manufacture lines ranged from 69% to 99% below the 1989 level), and the industrial share of GDP shrank from 26% to 14% in 1989–2006. The mining sector grew 1.9% in 2006; output of gas steadily rose and by 2006 was 31 times the 1989 level (a base level that was extremely low), whereas oil output rose four times but decreased 20% in 2003–2006; nickel output peaked in 2001 (64% above 1989) but in 2006 fell 5% below the peak. The manufacturing sector grew 1.9% in 2006. Sugar output steadily dwindled from 2.5 million tons in 2004 to about 1 million tons in 2007; the latter was 82% below the 1989 level and the worst harvest in a century. 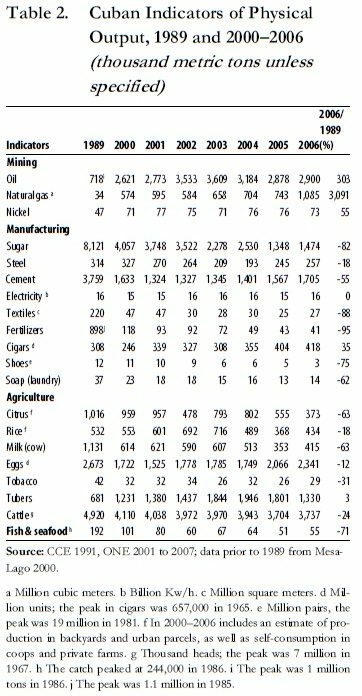 Production of other key manufactures in 2006 (steel, cement, textiles, fertilizers, shoes, soap) were from 18% to 95% below the corresponding 1989 level; only the output of cigars was above its 1989 level, whereas electricity output was the same in 2006 as in 1989. The agricultural sector declined for two consecutive years, by 6% in 2006; output of five key products (citrus, rice, milk, eggs and tobacco) in 2006 was from 12% to 71% below the 1989 level, and the number of heads of cattle was 24% below; only tubers and vegetables increased compared to 1989, but suffered a decline in 2005–2006. The fish and sea food catch in 2006 was 71% below that in 1989. The value of exports rose slowly but by 2006 was still 48% below 1989, whereas the value of imports steadily climbed and by 2006 surpassed the 1989 level by 16%. The deficit in the trade balance of goods set consecutive records in 2004–2006, reaching 9.4 billion pesos, 144% above the 1989 deficit level. Terms of trade in 2004 were 56% below the 1989 level (no data are available for 2005–2006). The share of sugar in total exports decreased to 8% in 2006, and the shares of other traditional exports also fell: tobacco to 9%, fish and seafood to 2% and citrus to 0.2%. Meanwhile, the share of mining products within exports rose to 48% in 2006, helped by rising world market prices of nickel, the share of pharmaceutical products increased to 6%, but that of cement decreased to 1.4%. Shares of food and manufactures in total imports rose, whereas those of chemicals and fuels declined (the latter due to Venezuelan subsidies despite escalating world market prices of oil), and of machinery-transportation rose due to the import of diesel engines and generators. The external debt in hard currency jumped 148% in 1989–2006, reaching $14.5 billion in 2006; the debt per capita (including the non-convertible debt with former socialist countries) was twice the Latin American average in 2004, while the hard-currency debt was 213% of the value of exports of goods and services, 54% above the regional average. Statistics on FDI have been discontinued since 2001, when it shrank by 91%, but a significant increase was reported in 2006; the number of foreign enterprises, however, fell 41% in 2002–2006, some of them shut down by the government. Venezuela (Cuba’s major trade partner) is approaching the role of great subsidizer of the Cuban economy that the USSR played in 1960–2000: selling oil at 42% of the world market price (a subsidy of $1.4 billion in 2006), allowing Cuba to build up a cumulative oil debt of $2.5 billion, and granting more than $4 billion in aid and investment. China rose to Cuba’s second trade partner, catapulted by the agreements signed in 2004–2006, but cancelled its promised investment in the Las Camariocas ferronickel plant, a project that is being continued by Venezuela. Due to the liberalization in the U.S. embargo, Cuba bought $2.2 billion of U.S. food products in 2001–2006, making the United States the island’s 7th largest trade partner. The number of tourists and gross revenue from tourism peaked in 2005 at 2.3 million and $2.3 billion, respectively, but the former decreased by 4% in 2006 whereas the latter dropped 12% (the number of tourists decreased by 7% to 13% in the first two months of 2007). The number of hotel rooms doubled in 1989–2006, but the occupancy rate fell from 74% to 61% in 2000–2006 and average daily expenses by tourists diminished from $175 to $97 in 2003–2005. ECLAC’s estimates on Cuba’s balance of payments for 2003–2005 indicate that the growing deficit in the balance of goods trade exceeded the climbing surplus in the balance of services trade, leading to a negative worsening total trade balance. Cuban data for 2006 suggest a similar outcome and a deteriorating current account balance. The value of tourist services was stagnant in 2006, hence the bulk of service exports in that year were Cuban professionals abroad, mostly physicians in Venezuela, but data have not been provided on the value generated by such professionals. The Cuban economy has survived in large measure due to Venezuelan investment, trade, credits and aid, and to less extent Chinese, as well as foreign investment in strategic sectors such as oil and gas, nickel and tourism, infusing confidence in Fidel to launch a process of recentralization of decision-making in 2003–2006 that reversed most advances made by the modest market-oriented reforms implemented in 1993–1996, and secure a tight transition of power to Raúl.24 In contrast to the overvalued GDP growth rates reported in 2005–2006, the history of Cuban socialism proves that recentralization and movement away from the market have provoked economic recessions and crises. Furthermore although Venezuela’s aid is an injection of resources to the dismal Cuban economy, the even more substantial Soviet aid was unable in three decades to counteract the ill-conceived domestic economic policies. The substantial Venezuelan investment, credits, and subsidies could be jeopardized if that nation’s economic-financial situation deteriorates: public expending grew 43% in 2006 widening the gap between government revenue and expenditures to 1.5% of GDP; inflation was 16% in 2006, the highest in the region and three times the average; net transfer of resources abroad were -$31 billion (the highest in the region and 30% of the total); and FDI fell by $2.5 billion versus positive in the previous ten years. If oil prices decline, the $36 billion in reserves will provide a buffer for at least one year; but if Chávez has to cut expenditures, he will start with foreign aid and Cuba being the heaviest foreign aid burden would be the first target (ECLAC 2006b; Luhnow 2007). The retrogression in Cuba’s reform and its causes has been analyzed elsewhere (Mesa-Lago 2005; Pérez-López 2006). Recentralization and the movement away from the market have created problems, like delays in receipts of needed imports, creditors unable to collect payments, and reduction in the number of joint ventures. De-dollarization in the short run generated more dollars for the Cuban government but will not solve the deep structural problems of the Cuban economy, such as the huge deficit in the trade balance of goods, the scarce and costly access to foreign credit, and the chronic insufficiency of hard currency, while it will provoke adverse effects like the resurrection of the black market in goods and dollars, a reduction in foreign remittances, and a decline in tourism from the U.S. dollar area. Since August 2006, a debate on future economic policy has taken place among Cuban economists after one decade of virtual silence. According to Rafael Hernández, “the Cuban people can believe that the economy is growing statistically but is not growing in their homes”; he reports proposals on decentralizing the economy, organizing cooperatives in areas outside of agriculture (e.g., in textiles and shoemaking), selling in private markets and expanding hiring beyond family members to include outside employees, and creating more small and medium enterprises. Pedro Monreal describes the debate as “cautious and controlled, but happening for the first time in many years.” He thinks that Cuba is deficient in motivation and innovation, does not let the market determine prices, provide incentives to enterprises and encourage them to take economic risks, hence the economy needs a thorough makeover along the lines of China and Vietnam, which would require far more decentralization and acceptance of private markets than Cuba has ever permitted (based on interviews by Bussey 2007 and Davies 2007). A team of economists and philosophers has begun a project to analyze Cuba’s socialist property. Ernesto Molina notes the poor competitiveness to confront globalization, obsolete knowledge of economics (Soviet economic texts were inadequate), problems tackled only with control, insufficient supply that does not satisfy demand and pushes prices up, and a crucial need for the public to become involved to solve these problems. Omar Everleny Pérez Villanueva believes that there should be an increase in the space for the private sector and cooperatives, and considers essential to establish a direct relationship between state jobs and enterprise profit: “It is impossible that with a monthly wage of about 200 pesos anybody could provide a good service and in addition procure the inputs needed to work.” Luis Marcelo Yera affirms that the fundamental decisions in enterprises are taken by the government and that more decisions should be transferred to workers, whereas state enterprises should compete with enterprises under other property forms. Hiram Marquetti criticizes the lack of quality of goods and services, illegal charges, and cheating of consumers in weighting goods at stores (cited by Orta et al 2006). At the end of 2006, Juventud Rebelde, the youth newspaper published the results of interviews among 280 young people about the Cuba of 2020, bringing renewed hope of change. The interviewees identified the economy as their major preoccupation and stated: “Today still we commit many errors… there are many things to straighten out [and for that] we need efficient leaders. [It’s urgent to engage in criticism] because otherwise we will continue in the bad path; currently there is talk of engaging in criticism but it is sometimes demagoguery and nothing is done in reality… The double standard should completely disappear… because some [managers] often demand honesty, savings and sacrifice from the workers whereas they do not practice such virtues.” The interviewees wanted a nation where money should be enough for people to meet essential needs, prices of goods match wages, the peso and the convertible peso become one, transportation improves, the streets are paved and water supply is adequate, without blackouts and prostitution (Pérez et al 2006). Raúl has publicly criticized corruption and bureaucracy, and introduced a few positive but minor economic changes relative to the recommendations of economists and demands by youths. But more importantly, he has allowed the lively debate taking place in Cuba, thus raising expectations for future change. First, at the National Assembly in December 2006, Raúl blamed poor domestic food production and the corresponding huge need for imports on bureaucratic procedures and payment delays to cooperatives and private farmers, who contribute 65% of agricultural production. Three months later minister Rodríguez informed that banks had established a revolving fund (with state funds) to promptly pay producers that present an invoice documenting sales; in May acopio prices to private farmers producing milk and beef were raised; and in June the Minister of Finance and Prices reported to the National Assembly that the debt owed to private farmers and cooperatives had been paid at the cost of 863 million pesos plus 550 million to cover losses in previous years (Granma, December 24, March 26, May 25, and June 28, 2007). Espinosa (2007a) argues, however, that these are palliatives that do not solve the deep-rooted problems of agriculture: despite their increase, acopio prices are still 6% of the retail price of milk and 1–4% of the retail price of various cuts of beef, whereas the 1.4 billion pesos payment of debt to farmers and coop losses will further fuel inflation in 2007. Third, there is new talk of eliminating the “dual” monetary system—peso and CUC—but although the U.S. dollar has been ostracized, five foreign currencies are legal tender. ECLAC has been pushing for convertibility arguing that the current system creates many distortions in fiscal accounting and monetary policy, and impedes the creation of a truly financial market, but no concrete measures have been taken in the last year (AFP, Mexico, February 7, 2007; AP, Havana, April 28, 2007). Fourth, more flexible customs controls were introduced in May 2007 to allow imports of electric equipment, engines and spare parts for motor vehicles, equipment to reproduce images and videos, spare parts for bikes, etc., all previously banned. However, visitors must declare to customs carrying more than 50 cigars or face confiscation unless they can demonstrate legal purchases (Cancio 2007). Fifth, corruption and lack of labor discipline are blamed by the leadership (including Raúl) for most economic problems, inefficiency and scarcity of goods. Several top leaders were dismissed for corruption and tough new labor regulations enacted in April mimicking prior unsuccessful attempts (Reglamentos del Ministerio del Trabajo, 187 and 188, 2007). Echoing previous statements by Fidel, Minister Rodríguez (2007) has stated that Cuba will not shift its economic model to follow those of China or Vietnam because of differences in characteristics between the countries, and that the transmission of power from Fidel to Raúl has not resulted in significant changes but rather in continuity, with some adjustments to make the model more efficient. The debate on socialist ownership mentioned above, he asserted, is not by a group within the government; he does not imagine other forms of ownership that can contribute to Cuba’s development as state property can, hence collectivization will be maintained and strengthened. Self-employment will gradually disappear as state efficiency increases: “We won’t open new space to small enterprises because we have reached the conclusion that the nation’s development cannot be based on small businesses” (“Cuba no Permitirá…” 2006). In his speech of July 26, 2007, Raúl stated that all of his brother’s major projects (the Battle of Ideas, the Energy Revolution) were continuing, albeit subjected to some necessary adjustments. He acknowledged errors and promised to introduce “structural changes” but warned that “all can’t be solve immediately [and] don’t expect spectacular solutions” (R. Castro 2007). Until Fidel dies, Raúl probably will not implement any significant economic policy changes, because of risk of the Maximum Leader’s criticism (via his reflexiones to the news media) against deviations from his failed economic legacy. 1. The author’s gratefully acknowledges Jorge Pérez-López for the supply of recent Cuban statistics, assistance in calculations and careful editing of the paper, and Joaquín Pujol for the ASCE news clip service. 2. After 2000, ECLAC discontinued publishing the average rate of GDP growth for the last 10 years. 3. Jorge Mattar, Adjunct Director for Central America of ECLAC’s Mexico office (the office that produces the annual report on Cuba) acknowledged to Juventud Rebelde the positive dynamism of Cuba’s economy based on international trade partners, although not as much on other sectors (AFP, Mexico, April 30, 2007). 4. ECLAC’s (2006a: 11) predictions for 2006 did not materialize: increase in agricultural output, stable sugar production, 4.6% rise in non-sugar industry, and 10% rise in the number of tourists. 5. Rodríguez (2007) contended that Cuba’s GDP rate in 2000–2006 averaged 6% versus 3.5% in Latin America, but if the ECLAC series that deletes the questionable 2005–2006 years is used, the Cuban rate would be 3.5%, the same as the regional average. 6. The price of bus trips jumped between 230% and 424%; round trip bus transportation Havana-Santiago costs 249 pesos, and by air it costs 440 pesos, whereas the average monthly wage is 312 pesos (Resolución 32, January 31, 2007). 7. ECLAC (2006a) argues that high inflation in Cuba does not lead to higher prices as in market economies (and yet prices in agricultural free markets and TRD did increase) but to restrictions in goods and services; because of the latter scarcity and reduction in imports, ECLAC predicted a worsening in such scarcity in 2006. 8. Guaicapuro Lameda, former president of Venezuela’s oil corporation (PDVSA), asserted that studies done in 2000–2001 showed that the investment in the Cienfuegos refinery was a bad one and it would be even less profitable in 2007 because of the additional six years elapsed. In addition, Cuba refused participation in the project by the Russian consortium Alfa Group, which has the refinery among its assets and owns the technology and knowledge needed to advise in the completion of the plant (Sánchez 2006). 9. Frank (2007b) estimate based on Sherritt International’s third quarter 2006 report that output of the Pedro Sotto plant was 3,000 tons short due to bottlenecks; annual output in the three plants was estimated as follows: 33,000 mt in “Pedro Sotto,” 33,000 mt in “Che Guevara” and 10,000 mt in “Ramos Latour.” In contrast, ECLAC (2006b)reported an increase in nickel output in 2006 but without giving figures, and José Luis Rodríguez stated that output was 75,000 in April 2007 (AFP, Havana, April 30, 2007). 10. Also an energy-intensive user, the Las Camariocas plant was only financially viable when the USSR subsidized the price of oil imports and bought nickel at high prices. At current record-high world market oil prices, it is not profitable despite high world nickel prices. 11. The major steel plant (Antillana de Acero) was being restructured in 2007, because of aging equipment, overstaffing and stoppages due to electricity blackouts (the plant was closed six months in 2004); 200 jobs are being cut and production in 2007 is expected to be “a little more than in 2006” (Trabajadores, Havana, March 5, 2007). 12. These small plants sited in cities across the country must be coordinated and connected with the national electric grid; if the latter fails, the small plants start functioning to maintain the service. 13. In 2003 the UBPC’s share of cultivated land was 46% but they only produced 4% of total tobacco output, 10% of vegetables, 20% of tubers, 25% of corn, 28% of beans and 30% of pork; the rest was produced by private farmers and traditional coops (Mesa-Lago and Pérez-López 2005). 14. The director of acopio, Leonel Valdivia, answered a journalist that asked about the possibility of acopio disappearing as a state intermediary: “No, because marketing would fall in the hands of private middlemen and prices would escalate.” The journalist rebutted that “producers gain more when they sell to private middlemen and receive their payment immediately” and Valdivia accepted the point (Pagés and Castaño 2006). 15. The author received a new book on the agricultural sector by Nova (2006) after this paper was completed. 16. According to the minister of transportation, the deficit accumulated was so huge that the situation has not improved: only 1,000 of the 8,000 buses to be imported from China had been received, the existing stock was not properly maintained, and the work force had not been trained to handle the new equipment (AFP, Havana, March 17, 2007). 17. Milk imports alone were projected to cost $200 million in 2007; the scarcity of milk for domestic consumption continued despite the doubling of its price in 2004–2007 (Granma, May 25, 2007). 18. Cuba initially committed to export 500,000 tons of cement to Venezuela accounting for 29% of total output in 2006, but 17 months later Venezuela’s minister of housing announced buying only 5,000 tons (El Universal, Caracas, February 6, 2006; El Nacional, Caracas, July 11, 2007). 19. Despite obstacles due to the lack of democracy in Cuba, the Iberoamerican Summit of 2006 declared that Cuba will be included in MERCOSUR through bilateral trade agreements (EFE, Córdoba, July 21, 2006). 20. In June 2006, Bacomex won a court suit in Italy to recover $35 million of Cuba’s $364 million debt, about 50% of the overdue debt portfolio of that bank. 21. The International Investment Bank, in which Russia is the major stockholder, is reportedly filling a suit against Cuba over its debt at the International Commercial Arbitration Court (SKRIN Newswire, June 5, 2007). 22. On the other hand, Sherritt International announced an investment of $1.25 billion in 2007 on oil, gas, electricity, and nickel (AP, Havana, June 6, 2007). 23. To confront the decline in tourism, the Cuban government has announced an investment of 185 million pesos to improve hotels and airports, and a cut by 20% of airline landing fees. 24. Decentralization of economic decision-making on the part of hundred of thousands of both state managers and those who run the tiny but dynamic private sector, involved a risk that many of them would eventually resist the continuation of regime control. 25. Editor’s Note: The comments are included in Cuba in Transition—Volume 17, as is also the referenced paper by Espinosa Chepe. 26. Among others: “Sobre la Transición Socialista en Cuba: Un Simposio,” Temas, 51–52, April-September, 2007, 126–162; James Petras and Robin Eastman-Abaya, “Cuba: Revolución Permanente y Contradicciones Conteporáneas,” Rebelión, August 2007; Fidel Castro, “Reflexiones del Comandante en Jefe: Los Superrevolucionarios,” Granma, September 3, 2007; CRI-FOCAL-FLACSO, “Governance and Social Justice in Cuba: Opportunities and Constrains,” Montreal, September 4, 2007; various panels at the LASA Congress in Montreal, September 5–7, 2007; Carleton University International Policy Forum “The Cuban Economy: Challenges and Options,” Ottawa, September 10–11, 2007; Roger Betancourt, “Human Rights and Economic Growth: Why the Real China Model MAY be Desirable in a Post-Fidel Transition,” University of Maryland, September 2007. The author is working on a paper analyzing the ongoing debate. 27. Data on the percentage of state enterprises under the PE are scarce and contradictory; in 2002 only 11% of enterprises were in the system, despite 20 years elapsed since its inception; no information was given in 2003–2005 when the PE was neglected; estimates for 2006–2007 range from 22% to 32% of enterprises and are questionable.